Top Tip One: Evening Dress is compulsory (unless you’re following in the footsteps of William Robinson aka Chung Ling Soo). FOR SALE. Evening Dress Suit, with extra white vest. 5ft 10in. in height, medium build. New condition. Price £2. Two Opera Hats. Good second hand condition. 3/6 each. Various small effects for sale or exchange. Top Tip Two: Don’t expect to become rich and famous too soon, freebie shows can get you started. Mr. Oswald Williams is an Englishman. He was born in London 1880. He is the son of a Church of England Clergyman, and the Grandson of the late Mr. Walter Lacy, the one time famous actor. His original profession was that of an Architect. of all the trouble. My dear old dad bought it to amuse the children with, but I was fascinated, and my father had no rest until he had handed it over to me. I mastered every one of those tricks and took a positive delight in mystifying people, with the result that for thirty years I may be said to have lived a life of deception. consisted of tricks with flags, cards, billiard balls, coins, etc, and concluded with an exhibition of hand shadows. It lasted nearly one hour. I can say with pardonable pride that it was not bad. I received no fee and was engaged to give another performance the next month upon the same terms. Keep an eye on the job ads, you never know where your big break will come from. Wanted an Expert Illusionist.- Four weeks’ engagement offered to Professional illusionist to open 25th November, four day’s rehearsal must be given. 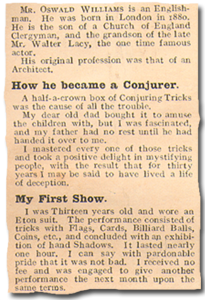 Reply immediately with full particulars to Mr. Will Goldston, Gamage Hall of Illusions, Holborn, London, E.C. 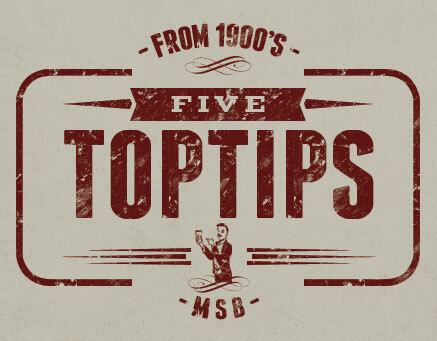 Top Tip Four: Don’t mess up! 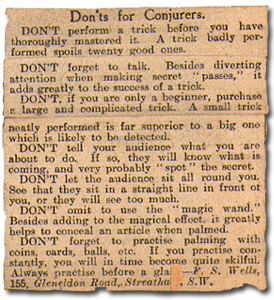 DON’T perform a trick before you have thoroughly mastered it. A trick badly preformed spoils twenty good ones. DON’T forget to talk. Besides diverting attention when making secret “passes,” it adds greatly to the success of a trick. DON’T, if you are only a beginner, purchase a large and complicated trick. A small trick neatly preformed is far superior to a big one which is likely to be detected. DON’T tell your audience what you are about to do. If so, they will know what is coming, and very probably spot the secret. DON’T let the audience sit around you. See that they sit in a straight line in front of you, or they will see too much. DON’T omit the use of the Magic Wand. Besides adding to the magical effect, it greatly helps to conceal an article when palmed. DON’T forget to practice palming with coins, cards, balls, etc. If you practice constantly, you will in time become quite skillful. Always practice before a glass. “CREMATION” ILLUSION (Optical). Quite portable and in perfect working order; very showy. Cost £30 to build. Will sell for half, or exchange for levitation or other good illusion not requiring traps. MANEK-SHAW, c/o Performer, 18, Charing Cross Road, London.